This introductory book deals with the bonds created between German physicians and the Nazi biomedical vision based upon racial and eugenic conceptions. These ideological connections and the attitudes of many Nazi doctors, culminating in the actions of Mengele and other SS physicians in Auschwitz, may be described as a Medicalization of the Holocaust. In July 1933, the sterilization law was enacted. Under the pretext of war, the Nazi modus operandi was changed to medical murder. It strove to stop the spread of hereditary diseases by gassing to death sick people judged “unfit” to be included among “Aryan Germans”. Although officially abandoned in summer 1941, Hitler used the expertise gained by the medical murderers to design the “Final Solution”. Nazi physicians operated the first annihilation camps like Treblinka, while others initiated the process of Ghettoization, arguing that the Jews were spreading epidemics. The second part of this book depicts the courageous efforts of many Jewish doctors to resist annihilation. In many ghettos, Jewish doctors worked on behalf of the “Judenrat” to try keep people alive. A clandestine medical faculty functioning in the Warsaw ghetto was the pinnacle of Jewish intellectual resistance. Even in concentration camps, physicians attempted to sustain the basic creeds of medical ethics by protecting and saving patients. 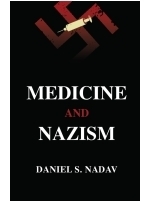 The last chapters of the book deal with the efforts to cope with the lessons of the Nazi misuse of medicine.